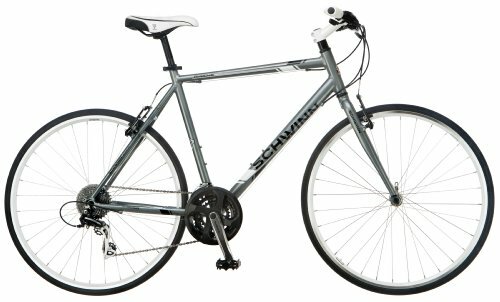 The Schwinn Phocus 1500 is a flat bar road bike which can be used for exercising, commuting as well as riding. The bike comes with a light weight Schwinn Aluminium Fitness Frame which keeps the weight of this bike in check and also makes it strong. The aluminium fork of this bike ensures a smooth ride quality by absorbing the hits and bumps off the road. Shimano shifters which have been used in this bike provide a 24 speed gear range and offer a wide array of gear combinations which enables it to handle any kind of surface with utmost ease and grace. The linear pull brakes offer ample braking power and work equally well in all conditions. The bike ships with alloy rims and 700c tires which offer strength and durability. The looks of this bike are certainly here to impress you. It is ideal for riding and exercising and the price tag associated with this bike makes it an extremely lucrative and cost effective option. The Schwinn Phocus comes equipped with Lightweight Aluminium Frameset which makes the bike strong and handy. Aluminium Fork functions efficiently in absorbing the hits and bumps off the road. 24-speed Shimano component equipped drivetrain which offers smooth, precise and fast gear shifting and offers a 24-speed gear range. Linear Pull Brakes provide sheer braking force and work quite well under all conditions. Alloy rims come with the promise of strength and durability. Flat handlebar with ergonomic grips makes riding more comfortable. If you are looking for a bike to get some exercise, this can be your perfect choice. Equipped with an aluminium frame, this bike is extremely light and handy. It has an aluminium fork which handles the road quite well and offers a smooth ride experience. Shimano component equipped drivetrain offers a 24-speed gear range which is sufficient to handle slopes and flat surfaces. Shifting is quite smooth and efficient and braking also works pretty well. The wheels of this bike are low-end and should be replaced before you start riding it. The saddle is also not very comfortable. The bike does not ship assembled and if you have not assembled a bike before, you might face a bit of difficulty. In case you do, make sure you take it to your local bike shop. The derailleurs and the brakes might need some tuning before you start riding it. Overall, the bike is ideal for city rides or getting some exercise. The ride quality offered is quite smooth and price point at which this bike is offered is also quite reasonable although it takes a bit of work to set it up and get it tuned.